Stone, who got his start in politics working for former President Richard Nixon’s campaign, is not accused of colluding with WikiLeaks or with Russians, or even of knowing in advance that WikiLeaks specifically would release Democratic National Committee and Podesta emails. But prosecutors appear to be interested in what conversations Stone had with the Trump campaign regarding WikiLeaks. Stone, Corsi and Credico have butted heads in various ways over their competing claims about their discussions regarding WikiLeaks during the campaign. Stone has insisted that Credico, a left-wing activist, was a back channel source of information for him about WikiLeaks’ plans to release information on former presidential candidate Hillary Clinton. Credico has denied the claim, though text messages show him providing Stone with insight into WikiLeaks’ plans. Special counsel Robert Mueller appears to suspect that Corsi, who is best known for his role in promoting the “birther” movement, could also have been a connection between Stone and WikiLeaks. Both Corsi and Stone dismiss that theory, though the pair have recently squared off in the media over testimony that Corsi has provided Mueller’s grand jury. To help make sense of what’s going on between Stone, Corsi, Credico and Trump campaign officials, here is a detailed timeline of all of the events that are known to have transpired during the 2016 campaign. Hackers believed to have been working for Russia’s military intelligence agency hacked the Gmail account of Podesta. Julian Assange revealed his organization, WikiLeaks, was planning to release information about Clinton. “We have upcoming leaks in relation to Hillary Clinton. … We have emails pending publication,” Assange told ITV. WikiLeaks released nearly 20,000 emails stolen from the DNC. A “senior Trump campaign official” was directed shortly after the release to contact Stone “about any additional releases” from WikiLeaks, according to the indictment of Stone. Stone said he interpreted “CF” as a reference to the Clinton Foundation. Corsi forwarded the email to Ted Malloch, a London-based academic who supported President Donald Trump’s campaign. Stone emailed Corsi with a list of three suggestions for Malloch that could potentially help the Trump campaign. “Malloch should see Assange,” wrote Stone. Stone has told The Daily Caller News Foundation that at the time he sent the email, he believed Malloch might have a channel to Assange. Stone said that during their first meeting in 2016 (which Corsi attended), Malloch made comments suggesting that he knew or had a link to Assange. Stone has since said he now believes Malloch was merely name-dropping and had no actual link to the WikiLeaks founder. Corsi sent Stone an email that would later draw intense scrutiny from Mueller. Corsi claimed he came up with a theory on his own that WikiLeaks had Podesta’s emails and that he shared that theory with associates, including Stone. Stone said he did not interpret the email as saying that WikiLeaks had Podesta’s emails. Stone said he had communicated with Assange. “I actually have communicated with Assange. I believe the next tranche of his documents pertain to the Clinton Foundation but there’s no telling what the October surprise may be,” he told a group of Republicans at an event in Florida. “Stone is a bullshitter,” WikiLeaks said in a private Twitter message released in 2017. The group would repeatedly deny having any contact with Stone. “Kunstler wife is his lawyer or at least one of them,” he said. Stone posted a tweet that would later thrust him into the center of the Russia probe. “Trust me, it will soon [be] the Podesta’s time in the barrel,” Stone wrote. Stone said rather than referring to forthcoming WikiLeaks emails, he was referring to a conversation he had with Corsi, who had researched the business activities of Podesta and his brother, Tony Podesta. Corsi provided a nine-page memo to Stone regarding the Podesta brothers and the Podesta Group’s various lobbying relationships. Corsi claimed that he told Mueller’s grand jury that he wrote the memo in order to help Stone create a cover story to explain his tweet from 10 days earlier. Corsi, who claims that he received immunity in order to testify on the topic, has not said whether Stone explicitly told him that the memo was part of a cover story. Stone has denied this allegation, which he calls “illogical.” He claimed there would have been no need for a cover story at the time because his tweet did not receive scrutiny until after John Podesta’s emails were published six weeks later. Credico asked Stone not to identify him as his link to Assange. Stone asked Credico to pass a request to Stone for emails related to Clinton’s tenure at the State Department. Credico “forwarded a request to a friend who was an attorney with the ability to contact [Assange],” according to the indictment. This exchange will undercut Credico’s future denials about knowing any attorneys for WikiLeaks. Credico traveled to London, but said he did not meet with Assange. Credico again asked Stone not to link him publicly to WikiLeaks. “Leave my name out Im [sic] going to be all screwed up today,” Credico wrote. 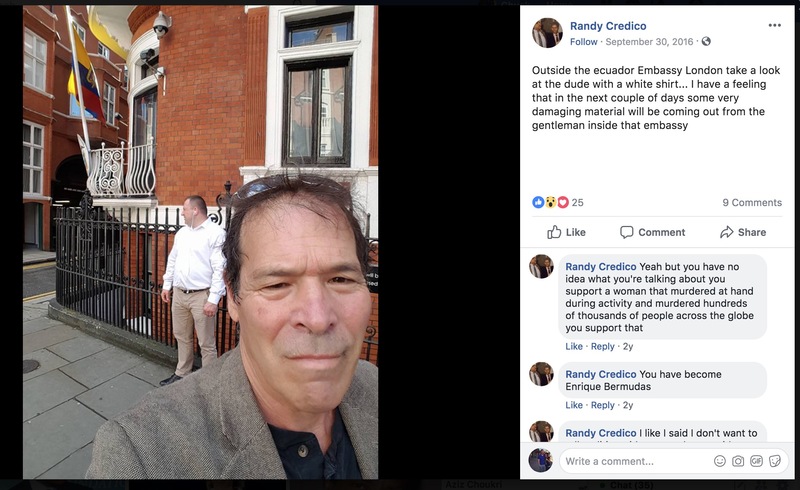 Credico posted a photo of himself on Facebook from outside the Ecuadorian Embassy in London. “Outside the ecuador [sic] Embassy London take a look at the dude with a white shirt … I have a feeling that in the next couple days some very damaging material will be coming out from the gentleman inside that embassy,” he wrote. “Hillary’s campaign will die this week,” he texted later that day. “Wednesday @HillaryClinton is done,” Stone wrote on Twitter. 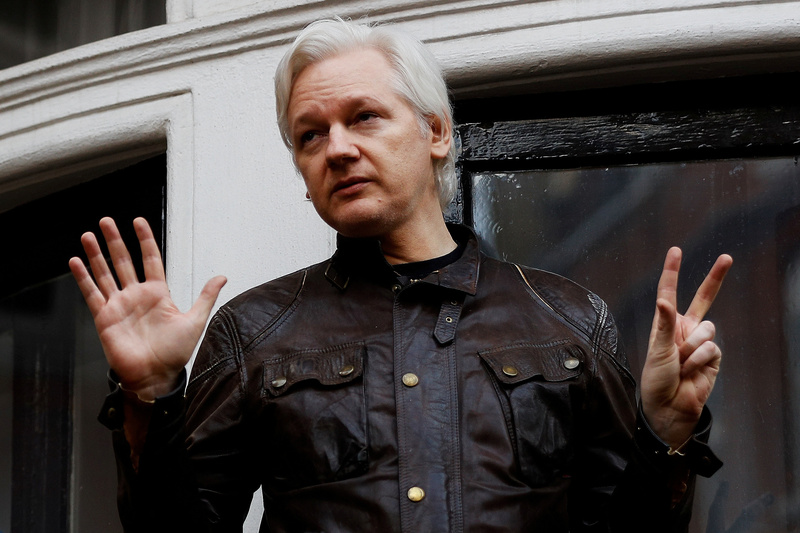 WikiLeaks canceled a press conference with Assange, citing security concerns. Corsi also tweeted in response to Assange’s canceled press conference. “I think its on for tomorrow,” he said. Credico wrote to Stone that information would be released Tuesday. Assange held a press conference and announced WikiLeaks would release documents prior to the election. He said the pending release was not targeted at Clinton and documents would be leaked beginning that week. Stone exchanged emails with former White House strategist Steve Bannon regarding Assange’s press conference. “Fear. Serious security concern. He thinks they are going to kill him and the London police are standing down,” Stone responded. Numerous Trump supporters, including Corsi, expressed frustration at the press conference. Stone continued teasing the WikiLeaks release. “Julian Assange will deliver a devastating expose on Hillary at a time of his choosing. I stand by my prediction,” Stone tweeted. Corsi claimed he told Mueller’s grand jury that Stone contacted him earlier in the day after hearing of the impending release of the “Access Hollywood” tape. He claimed Stone asked him to contact WikiLeaks to orchestrate the release of John Podesta’s emails. Stone has also disputed this claim, calling it “absurd.” He has said he had no advance knowledge of the publication of the tape, and that if he had, he would not have asked Corsi for help in contacting Assange given that he believed Corsi had no connection to WikiLeaks. The indictment alleges that in subsequent conversations with Trump campaign officials, Stone “claimed credit for having corrected predicted” the WikiLeaks release. Podesta accused Stone of having prior knowledge of the WikiLeaks release. Stone disputed Podesta’s comments and for the first time said he had a back channel to Assange. Stone appeared before the House Intelligence Committee. He refused to reveal the identity of his WikiLeaks back channel. Stone privately identified Credico to the Intelligence Committee. The special counsel cited other texts that show Stone encouraging Credico to avoid testifying to Congress. Credico asserted his Fifth Amendment rights prior to an interview scheduled with the House Intelligence Committee. Credico said he provided “disinformation” to Michael Isikoff and David Corn, the authors of “Russian Roulette,” a book about the collusion investigation. “I put together phony emails, gave it to them. I did all this stuff, and he’s going to put it in his book. I can’t wait,” Credico said in an interview with H. A. Goodman. “I’m just making things up for the guy, and he’s just writing it down,” he said. In an interview with Isikoff, Credico reiterated his denials that he was Stone’s link to WikiLeaks. He also denied he knew attorneys who worked for Assange, undercutting his claims in his text messages with Stone. Credico said in an interview with radio host David Feldman that he pleaded the Fifth before House Intelligence on the instruction of his lawyers with the American Civil Liberties Union. “So at the advice of my lawyers I took the Fifth,” said Credico. 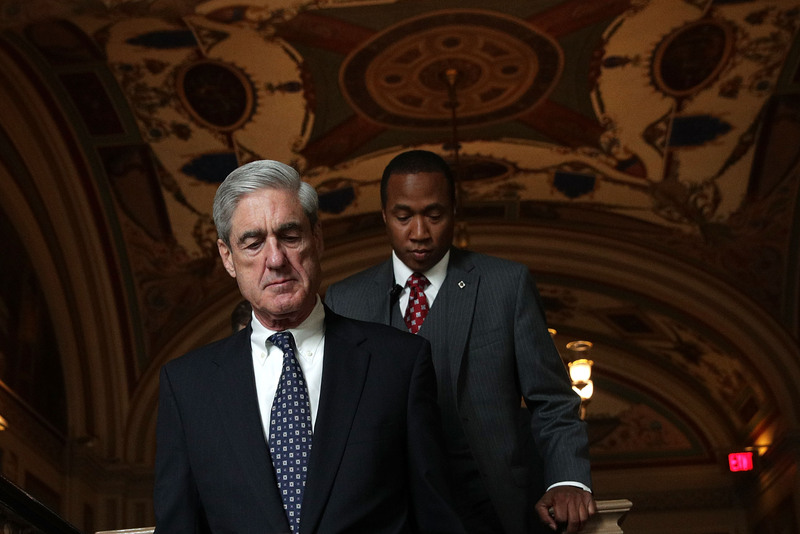 Mueller indicted 12 officers with Russia’s military intelligence agency, the GRU, over the hacks and dissemination of DNC emails. Credico testified to Mueller’s grand jury. He said in an interview with CNN after his appearance that his testimony matched his public denials that he was Stone’s back channel to WikiLeaks. David Lugo, a filmmaker who has worked with Stone and Credico, testified to the Mueller grand jury that Credico told him on May 12, 2017 that he was a conduit between WikiLeaks and Stone. Corsi testified for the second time before Mueller’s grand jury. He claimed days later that prosecutors had informed him he would be indicted for perjury. Mueller’s office offered Corsi a plea deal that would have required the conspiracy theorist to plead guilty to lying about the specifics of his email exchanges with Stone in July and August 2016 that referred to Assange. Corsi claimed he rejected the plea deal because he did not lie to prosecutors on purpose. Corsi releases a book, “Silent No More,” detailing his interactions with the special counsel and his activities during the 2016 campaign. He denied having any contact with Assange or WikiLeaks, but also made claims that could pose legal problems for Stone. Stone was indicted on seven charges: five charges of making false statements to Congress, one charge of witness tampering and one charge of obstruction of a criminal proceeding. Most of the charges related to Stone’s testimony to the House Intelligence Committee. Stone disputed the allegations and said he will plead not guilty to the charges.